This Creme Fraiche Salmon Dip is the perfect party appetizer. Try pairing it with a couple different varieties of Chardonnay to see which you like best! Their Oaky & Buttery Chardonnay, which comes from California, has notes of vanilla, butter and oak. Their Fruity & Crisp Chardonnay, coming from Australia, has citrus, melon and peach notes. Notable is the first wine that highlights the flavor profiles of its wines right on the front of the bottle – helping to make things just a bit less intimidating when you’re perusing the wine aisle. All you have to do is follow the flavor notes on the front of the bottle to easily make a judgment as to which bottle you’re going to prefer! I feel like everyone has their own style when it comes to Chardonnay, so it’s the perfect wine to sample with a group – For example, Rick likes butter bombs – The more a Chardonnay tastes like a big bowl of popcorn, the more he’s in love with it. Me? I could really go either way. I like to vary my Chardonnay preference based on the food I’m eating it with. 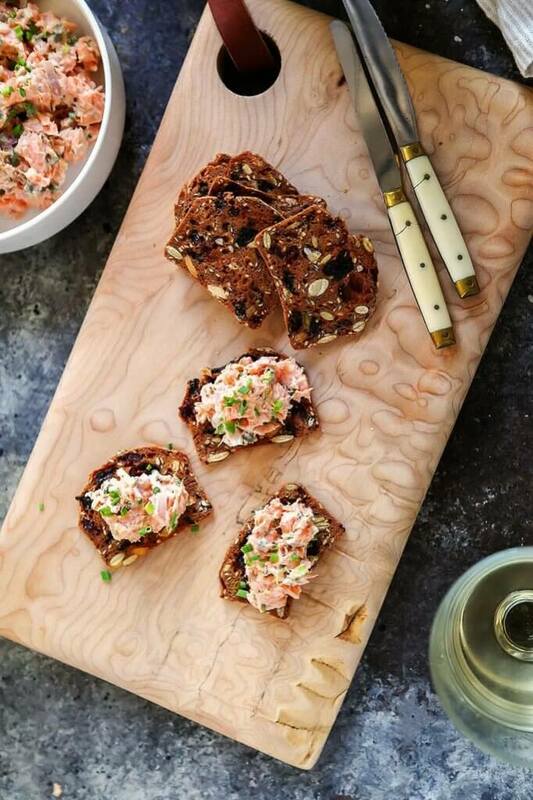 For my “Chardonnay Party” I wanted to keep the appetizer I was pairing with it pretty neutral – Meaning that it would pair wonderfully with both the Oaky & Buttery Chardonnay AND with the Fruity & Crisph Chardonnay… Creme Fraiche Salmon Dip came to mind immediately. 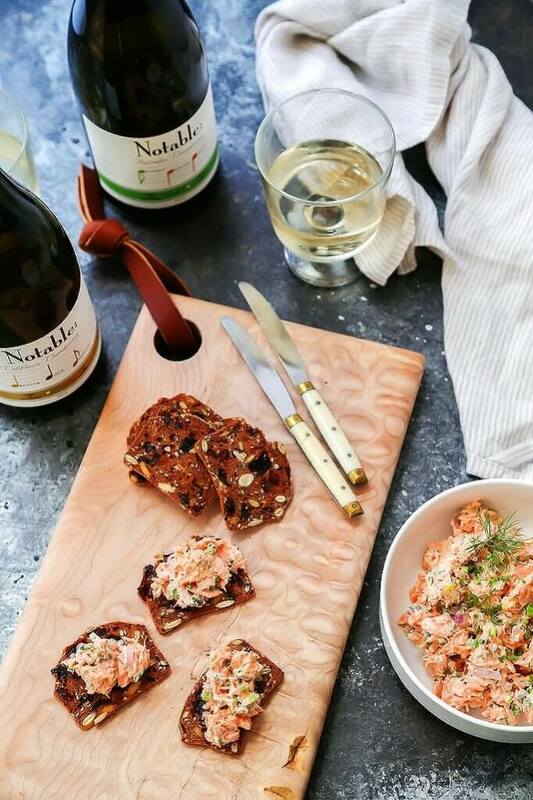 This Salmon Dip is perfect for pairing with both varieties of Chardonnay – Because of its richness, and the creamy creme fraiche and cream cheese, it’s a match for that Oaky & Buttery Chardonnay – Both are creamy and totally decadent. But, this dip also makes a great match for that Fruity & Crisp Chardonnay because of its citrus notes – This Chardonnay’s bright lemon flavor and hint of acidity balances out the Salmon Dip nicely. I actually preferred the Fruity & Crisp Chardonnay as a pairing – The contrast of flavors was perfectly balanced and made me want to sip and sip and eat and eat! Which style Chardonnay do you think you’d enjoy most with this Creme Fraiche Salmon Dip? Let me know in the comments below! Heat oven to 375°. Place salmon in an 8” x 8” baking dish and drizzle with 2 tbsp. lemon juice, olive oil, salt, and pepper. Bake 15 minutes until cooked through; set aside to cool. When salmon is cool enough to handle, combine with crème fraiche, cream cheese, parsley, dill, chives, shallot, remaining lemon juice, and zest. Season with salt and pepper. Serve on crackers or toast points with vegetables on the side. That dip looks like a good pairing for any wine! I like the idea of this Chardonnay duo for a get together so everyone can compare and contrast the two chardonnay profiles! Right? I think that wine tasting parties like these are always so fun because each person has their own unique tastes. Yum, I love salmon dip and it sounds like it would pair so well with these wines! Yum!! I love salmon dip but have never made it! I love the packaging on that wine! So fun! Right Lindsay? It makes things so much more simple! Great party food, thank you! Perfect for a party – And wine! Cheers!